SWE partnered with NSBE, SHPE, and the FIRST Robotics Team 5837 Unity4Tech for a special screening of the movie Hidden Figures. The FIRST Team also showcased their robots from 9:30 - 10:10 AM. Cost: Students attend FREE! Cost for adult chaperones is $5. SWE was invited to participate in the Girl Scouts Career Rally on Saturday, November 12. Girl Scouts went around to various careers at the rally, some of which included a teacher, a firefighter, a yoga instructor, and a ROTC member. SWE taught girls what an engineer's career might look like - explaining anything from the Food Engineers that make sure candy is safe to eat to the Computer Engineers that make our data safe online and the Manufacturing Engineers that design John Deere's assembly processes. It was so fun to see the girls' interest in engineering spark as they learned everything an engineer can do. The 2016 Cedar Valley Family STEM Festival took place on Thursday, November 10 from 4:00 PM to 7:30 PM at the Five Sullivan Brothers Convention Center (200 W. 4th St.) in Waterloo. Over 70 organizations from the Cedar Valley and throughout Iowa presented exhibits and hands-on activities for kids pre-K through 12 and their families. CV SWE partnered with John Deere's Women in Operations to teach kids of all ages electrical engineering concepts by building holiday light circuits! In May, Cedar Valley SWE worked invited girls that have been engaged in STEM Mentoring at Orange Elemenary and Lou Henry Elementary Schools to a John Deere Product Engineering Center Tour to further engage them in engineering and STEM. While on the tour, the girls witnessed "engineers in action" by walking through various cubicle aisles, stopping to ask engineers questions about what they do. Also, they went into the Virtual Reality room to view a model tractor and learned more about 3D Printing. At the end of the day, the girls designed, tested, and built Stomp Rockets. In November, Cedar Valley SWE completed two outreach events for K-12 children in the area. The Girl Scout Badge day was held on November 8th. During the event, 32 Brownies completed an activity to receive STEM-related badges. Then, on November 13th, SWE hosted a booth at the Cedar Valley STEM Festival at the Five Sullivan Brothers Convention Center in Waterloo. Over 3,100 adults and children attended and got the opportunity to participate in activities hosted by local companies, schools, and organizations. At SWE's booth, children made paper gliders and got to test out different designs to create the most efficient glider. We are currently looking for new mentors to expand our STEM mentoring program at Lou Henry & Hoover. We started this program last year, and we had such a successful year that we are expanding! We are a group of STEM professionals who mentor girls in 4th, 5th, & 6th grade at Lou Henry Elementary and Hoover Middle School. The purpose of the program is to mentor girls who have showed an interest in STEM, and give them role models from the local area who are already working in a field of STEM. We meet once a month as a group after school and 1:1 with our mentees twice a month, a total commitment of 4 hrs/month. During the group session we review the project we are working on, discuss next steps, work with other groups. You will meet 1:1 with your mentee during the school day to continue working on your project. We will meet from September to early June, throughout the school year. If you are interested in being part of this rewarding mentoring program, please contact CedarValleySWE@gmail.com. Please contact by August 15th. Last spring, we organized Iowa's first ever Expanding Your Horizons conference. Over 70 middle school girls from the Cedar Valley attended and had the opportunity to learn about various career paths in math and science fields. The conference consisted of 12 different workshops put on by University of Northern Iowa departments, Cargill Inc., MAGMA Technologies, ConAgra, and Viking Pump. Thank you to all our volunteers and donors who helped make the first annual conference a success. Please contact CedarValleyEYH@gmail.com if you are interested in volunteering, donating, or hosting a workshop during the next conference coming in October 2014. 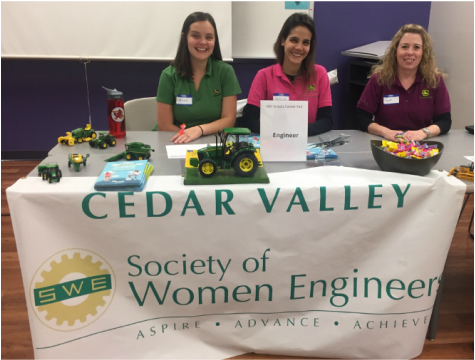 On February 20, 2014, Cedar Valley SWE teamed up with organizations at John Deere to host "Introduce a Girl to Engineering Day" for Engineering Week. 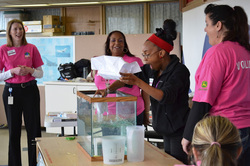 The event was held at the Bluedorn Science Imaginarium with 32 girls from Hoover Middle School. The all-day event consisted of creating BristleBot toothbrush robots and designing and testing a protective enclosure for a Pringle (must survive water submersion, the weight of a book, & a 1-story drop!). The girls had the opportunity to present their designs and network with female engineers in the community. Teammates is a great program with the focus of providing support and encouragement to school aged youth. Originally founded in 1991 with 22 mentor matches, the program now provides mentors to 50,000 youths in Nebraska and Iowa. For the 2013-2014 school year, the program will begin matching women with girls in a new program called Girls in STEM. They are in need of additional volunteers to mentor at Waterloo Schools. Please contact Heidi Kenkel (KenkelHeidiM@JohnDeere.com) for a brochure and application. Visit the organization's website for more information on how you can help! This Spring, 8th grade girls from George Washington Carver Academy attended Introduce a Girl to Engineering Day sponsored by John Deere Waterloo Operation's WomenREACH, the Society of Women Engineers, and John Deere INSPIRE. Students worked with engineers from John Deere on a variety of hands-on projects designed to spark their interest in Engineering. View the video below details on the projects the girls completed. Click here for pictures from the event.